The influential collaborators’ work has been presented at such prestigious exhibitions and institutions as the 12th Biennale de Lyon; the 55th Venice Biennale; The Stoscheck Collection; Kunsthaus Zürich; and Bonniers Konsthall; Rubell Family Collection/Contemporary Arts Foundation, Miami; and Fabric Workshop and Museum, Philadelphia, PA. 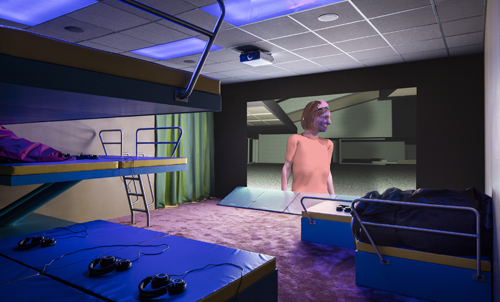 Experience the frenzied, social media-inspired films and sculptural theaters of influential collaborators Lizzie Fitch and Ryan Trecartin. Ryan Trecartin, Permission Streak, 2016 (HD Video, duration 21:17). Courtesy of Ryan Trecartin; Regen Projects, Los Angeles; Sprüth Magers.